Credit: NASA/CXC/Eureka Scientific/M.Roberts et al. G11.2-0.3 is a circularly symmetric supernova remnant that contains a dense, rotating dead star at its center, representing a textbook case of what the remnant of an exploding star should look like after a couple thousand years. When a massive star collapses, the outer layers of the star are blown away in an extremely energetic explosion. Depending on the mass of the original star, a dense object such as a neutron star or a black hole, can form and be left behind at the explosion's center. Such a neutron star, known as a "pulsar" when it rapidly rotates, can be kicked by the thermonuclear shock wave created when the star exploded, causing it to race through space at millions of miles per hour. 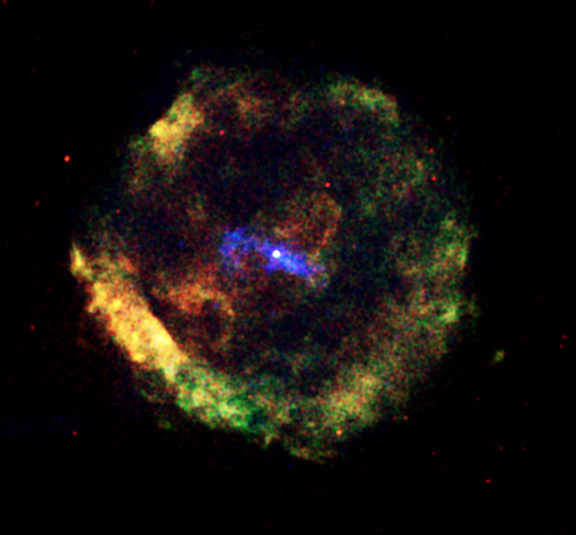 By combining X-ray and radio observations, astronomers have evidence that G11.2-0.3 is likely the result of the explosive death of such a massive star, perhaps witnessed in 386 A.D. Radio observations measure the remnant's expansion rate, which, in turn, can be used to calculate how long ago the star exploded. 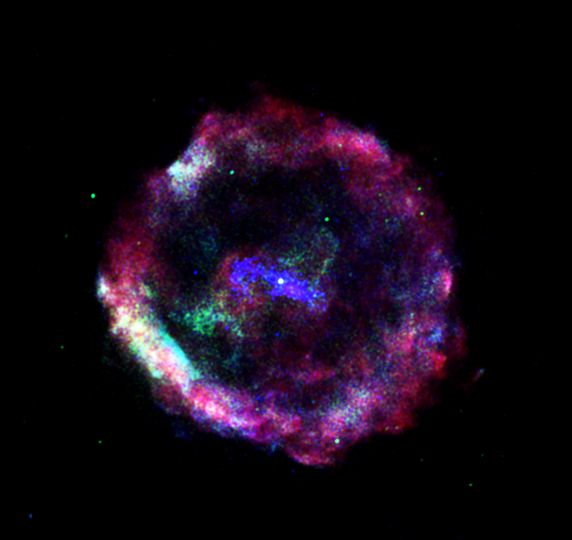 The radio data is consistent with association of the supernova remnant with the "guest star" reported by Chinese astronomers nearly 2,000 years ago. Chandra's ability to pinpoint the pulsar at nearly the very center of G11.2-0.3 also supports the idea that this debris field could have been created around the time of the Chinese observations. Surprisingly, the age of the pulsar determined from the X-ray and radio data differs from the standard pulsar age estimate, usually determined from how fast it is spinning. In this case, the so-called spin parameters suggest the G11.2-0.3 is 10 times older than the remnant age. This argues strongly that young pulsar spin ages can be very misleading and should be considered with caution. In Chandra's X-ray image, the pulsar and a cigar-shaped cloud of energetic particles, known as a pulsar wind nebula, are predominantly seen as high-energy X-rays (blue). A shell of heated gas from the outer layers of the exploded star surrounds the pulsar and the pulsar wind nebula and emits lower-energy X-rays (represented in green and red). Credit NASA/CXC/Eureka Scientific/M.Roberts et al.